There are a fair number of smart lock options out there, and unfortunately not a lot of them are well reviewed. I was on the fence for a long time trying to decide which system to try out. I ultimately ended up with the August Pro smart lock for a few reasons. It has a door state sensing feature to tell you if the door is open or closed. The last point is kind of a joke, but it was handy that I got to buy this without it really costing me anything except for credit card rewards points. The August Pro was super easy to install, literally only needed a screw driver. I do need to go back and properly install the magnet used for the door status sensor, but for now it is installed with the double sided tape provided in the kit. Once it’s warm enough to leave the door open while I drill into the door frame I’ll install it properly. Setting up the August Pro with the Android app was fairly painless, though I don’t ever intend to use it since it’s annoying to wait 10 seconds for it to pair to your devices bluetooth once the app is opened. Setting the lock up with Home Assistant (via Z-Wave) on the other hand turned out to be a huge PITA, but that was mostly my own fault. 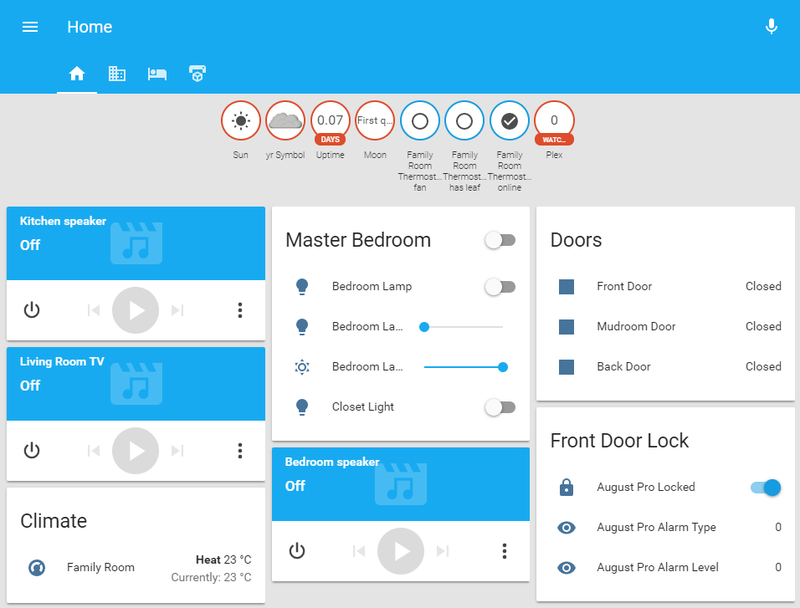 I knew in advance that in order to connect a secure Z-wave device, I would need a network key on Home Assistant. I created it as outlined here, and was able to pair the devices by clicking the “add secure node” in the Z-wave configuration page in HA and then following the prompts in the August app. This actually worked the first time I connected it and was able to lock and unlock the door from HA. It showed up with 4 sensors that were not descriptive enough to figure out what they did, and playing with the lock didn’t seem to change their values. Part of the reason I wanted it was for the door state sensor and I assumed something went wrong during the set up process that wasn’t allowing HA to read this over Z-wave. I tried removing the lock from the Z-stick and adding it back, this is where everything started falling down. I could get the lock to reconnect to the Z-wave network, but it wouldn’t actually talk to the lock. HA showed the lock but clicking the lock/unlock toggle didn’t do anything anymore. This ultimately lead to me getting frustrated and leaving the lock (and HA) alone for a few months. Eventually (yesterday) I decided to try again, but figured since HA officially started supporting August devices as of 0.64.0, maybe that would help. See my last post for the update from 0.60.0 to 0.65.6 which surprisingly went quite smoothly. First thing I did once everything was updated and working, was to reset the Z-stick and the August Pro. With a freshly wiped Z-stick, I left the network key in HA alone, and went through the process of adding a secure node again. This time adding it worked as expected and I am now able to lock and unlock the front door from HA but the response time varies between 2 – 10 seconds. I guess I should have expected slower response time from a battery operated device, but it’s still disappointing. Unfortunately the sensors that come along with the lock.locked component still don’t seem to change with the state of the door. Maybe there’s a delay in HA getting the sensor update, but it’s currently -10ºC outside which is preventing me from leaving the door open for 5 minutes waiting for an update. Once it’s a little nicer outside, I’ll mount the door magnet and play around to see if those sensors so anything. For now, I’m happy that I can lock and unlock my door remotely if required, or better yet check that the door is locked remotely. I did install the August component in my configuration.yaml file, but I later realized that without installing the August Connect device that came with the lock, HA would have no way to talk to the lock. The Connect is a WiFi and Bluetooth device that acts as a bridge between WiFi devices and the lock, allowing for you to lock and unlock the door from farther than a few feet from the lock. For some reason, I cannot get this device to connect to my WiFi, so it’s no use as a bridge. Since bluetooth has a limited range, the COnnect needs to be plugged in near the lock, but apparently the Connect has a pretty weak WiFi antenna and can’t connect to my router which is in the basement. No Connect means no native HA support for the August Pro. I have a Ubiquiti WiFi AP that I’ve been meaning to mount to my ceiling to extend the range of the WiFi, so maybe once I get that working I’ll revisit the Connect. Overall, I’m pretty disappointed with the August Pro. The z-wave connection issues aside (as they were my fault), the lack of clear sensor names and apparent uselessness of said sensors is really annoying. The response time can be frustrating, especially since it can actually be slower than pulling my keys out and locking the door manually. However, the fact that I can now remotely check that my door is locked and lock/unlock it as required is very useful, especially since I didn’t need to change house keys or end up with a different key for the front and back door. Maybe once summer rolls around I can figure out what those sensors are and make them useful in HA. For now, I’m just happy that my smart lock is finally smart enough to connect to HA. Next step is to add back all of the original Z-wave devices that were cleared out with the reset. Til next time!